Motor drive board perfect fort DIY intelligent cars. The ElecFreaks motor:bit Motor Driver for micro:bit is compatible with the micro:bit and can drive 2-channel DC motor at the same time. Its biggest characteristic is that we can realize one-channel motor direction control with only one IO port, which reduces the number of IO ports used. 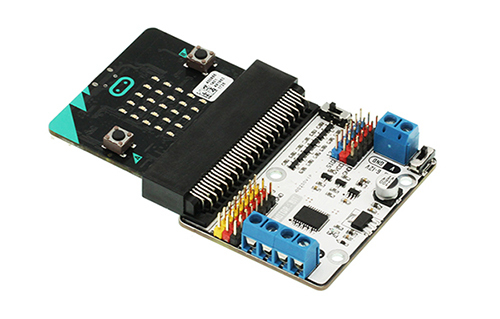 When it drives 2-channel motor, it is not possible to plug connectors like LED matrix, IIC, SPI, etc. Besides, it can lead out partial IO ports with GVS format, among which P13-P20 ports have 3.3V/5V electrical level switch function. It is a good companion for DIY intelligent cars.